• Know where to find usable resources. As soon as your teen knows his/her schedule, look up websites that can help in a crunch. Local college libraries are perfect resources for high school Advanced Placement students and normally offer cards for local residents. • Write down the times the teacher is available for extra help and encourage your teen get it when it is needed. • Work on your teens organizational skills..
• Encourage your teen by being there for him/her. You do not need to know what his/her vocabulary means to be able to look at the answer sheet and quiz your teen. This one-on-one time means a lot. • Hire a tutor. There is no shame in getting some professional help, especially if it works and if you don’t have enough time to study your teens because of your work. 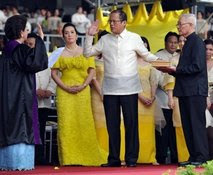 Benigno Aquino took over as president of the Philippines on Wednesday with a vow to lift his nation out of poverty and wipe out crippling corruption that he said thrived under his predecessor. "Today marks the end of a regime indifferent to the appeals of the people," Aquino said in one of many stinging criticisms of Gloria Arroyo, whose nearly 10 years in power were marred by allegations of vote rigging and massive graft. "Through good governance in the coming years we will lessen our problems. The destiny of the Filipino will return to its rightful place and, as each year passes, the Filipino's problems will continue to lessen."